TomorrowWorld is a 3-day music festival (and 5-day camping experience) nestled within 8,000 acres of expansive forests and lakes known for mind-blowing décor, massive artist line-ups, A-class camping, and gourmet food. 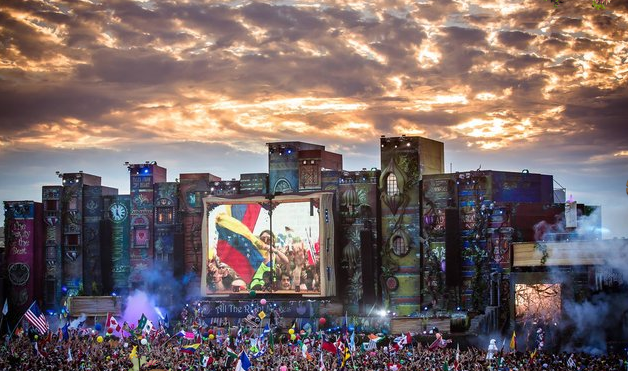 In 2013, TomorrowWorld was the first European electronic music festival of its scale in the US and the first US festival to set a minimum age of 21. The Fairytale continues… TomorrowWorld returns September 26-27-28, 2014. Hailing from Belgium, the mother festival of TomorrowWorld, Tomorrowland, will celebrate its 10-year anniversary this July. To mark this anniversary, two weekends will play host to the sold out pilgrimage of over 350,000 International guests. The magic and inspiration of TomorrowWorld is crafted from Tomorrowland, where stages and concepts come to life, experiences are created, and musical explorations are made. 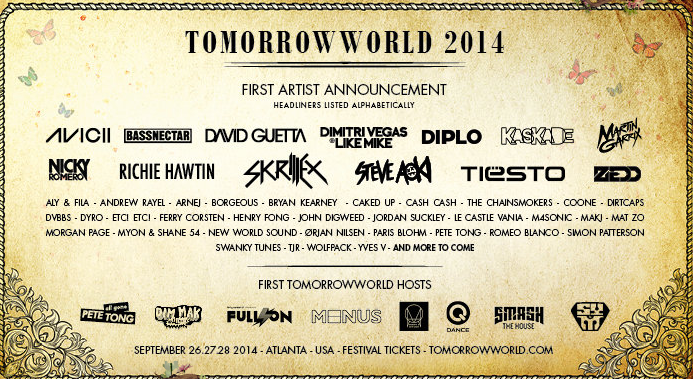 This September 2014, the second edition of TomorrowWorld will take place in Chattahoochee Hills, just outside Atlanta, Georgia. Join thousands of friends from around the world for the experience of a lifetime … Welcome to TomorrowWorld! ** As the event approaches, all purchasers of Comfort (VIP) tickets will receive an email that provides instructions for how to download their complimentary Specials Parking (1 per order). Every DreamVille Pass is valid for 5 days &amp; 4 nights from Thursday September 25, 2014 – Monday September 29, 2014. Every DreamVille Pass allows you to check in on Thursday September 25, 2014, so you are able attend the Official DreamVille Gathering Party. Please click HERE for more DreamVille information. Come relaxed to DreamVille without having to bring any camping supplies. We install your limited edition TomorrowWorld tent with air mattress, mattress cover and a little light to make it cozy. 2 Person Tent Packages: Will include 2 wristbands, one for each person in the tent. 4 Person Tent Packages: Will include 4 wristbands, one for each person in the tent. Everything you like about camping, but without sacrificing any luxury. Immerse yourself in our brand new Dream Lodge formula. Have a stay in a spacious, luxurious tent with full-size bed and comfortable mattress. We provide everything so you can enjoy the wonders of the DreamVille camping without the packing stress. You’ll get your own locker, electricity, extra storage space and a spacious terrace with comfortable chairs and a table. Feel yourself at home in our Dream Lodge village. This package is for 2 or 4 people. The ‘Dream Lodge’ is valid per tent. Travel within a Magical Fantasy world, uniting the People of Tomorrow…Customize your Global Journey voyage for the ultimate all-inclusive travel package to TomorrowWorld 2014! Click HERE for more information about Global Journey. The first round of artist announcements is below with more to come. The most famous DJ’s from around the globe will be performing!